His rescuers helped him see the sun again. Suraj's name means "sun" in Hindi, yet he knew nothing but darkness for decades. 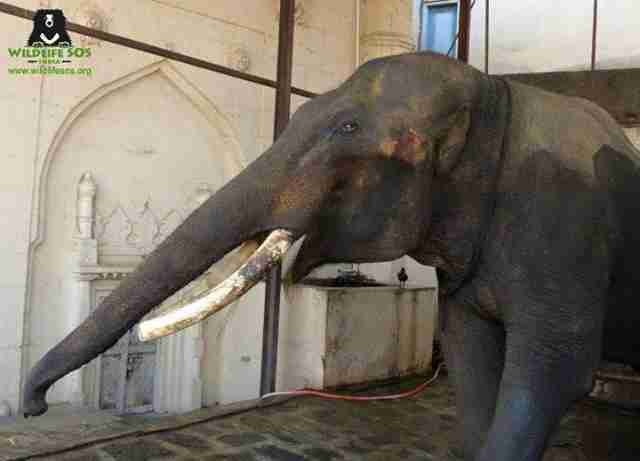 The 45-year-old elephant lived at a temple in Maharashtra, India, where he was neglected. He spent most of his time confined to a small, stone room with spiked chains wrapped around all four feet, restraining his movements. "When we learned of his plight, we knew we had to do all we could to save him, and to show him the kindness and care he had never known," Geeta Seshamani, cofounder of Wildlife SOS, said in a statement. 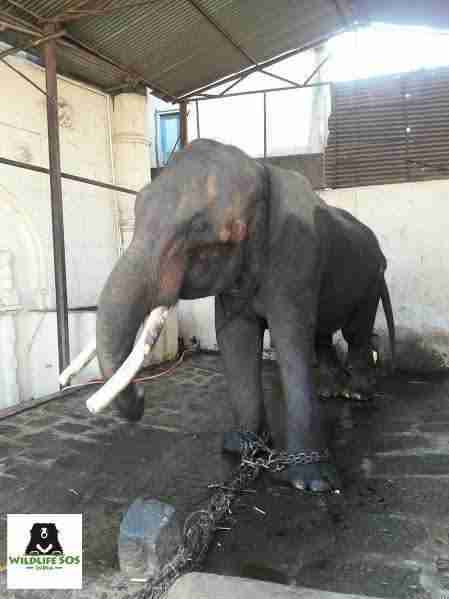 The Wildlife SOS team immediately set the wheels in motion to get Suraj out of the dark and into the light. But it wasn't easy. 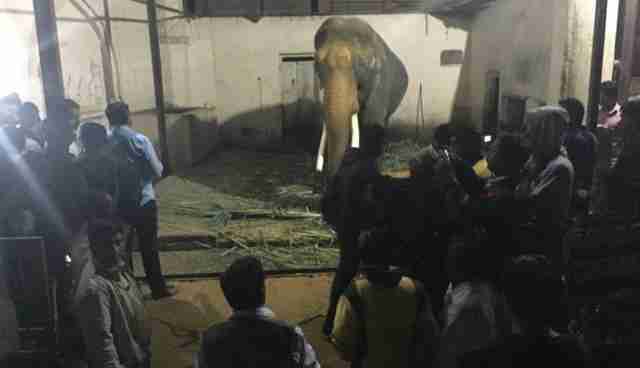 Despite obtaining official permission to rescue Suraj, the team was faced with 10 hours of negotiations and resistance from a large mob hellbent on keeping the elephant in his prison. 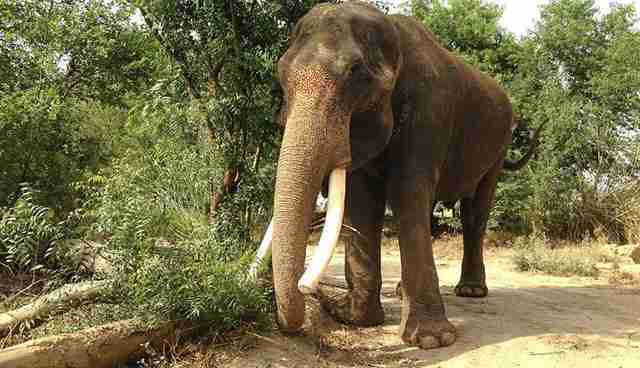 But at last, at nearly 4 a.m. on the morning of December 20, 2015, Suraj was coaxed onto an elephant ambulance and driven away, escorted by local police officers and officials from the state forest department. It wasn't until Wildlife SOS veterinarians got a close look at him that they were able to understand just how mistreated he had been. "Our vet got to work examining him, and discovered that poor Suraj is basically suffering from the tip of his trunk to the end of his tail," the organization wrote in a blog post. 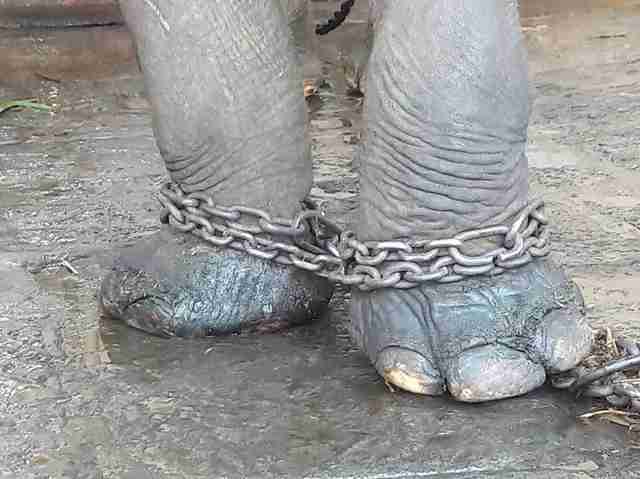 "He has bullhook wounds on his head, a lice and tick infestation, cracked and painful toenails, foot rot, infection in both eyes and even a severe injury to the tip of his tail." Perhaps the most disturbing discovery was that Suraj was missing his entire left ear. Although no explanation was given by the temple, Wildlife SOS believes that his ear might have been torn off when he was poached from the wild as baby over four decades ago. Suraj's story is just one of many. "Sadly although [elephants] ... are worshipped in temples throughout the country, they are housed in pathetic conditions in ignorance of their complex physical, psychological and social requirements," Kartick Satyanarayan, another cofounder of Wildlife SOS, said in a statement. 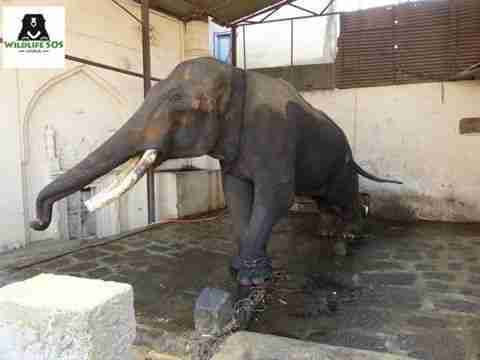 "As temple elephants go, Suraj's condition was in violation of several guidelines and laws in India." ... where he was welcomed with sugarcane and bananas - a sweet start to his new life. 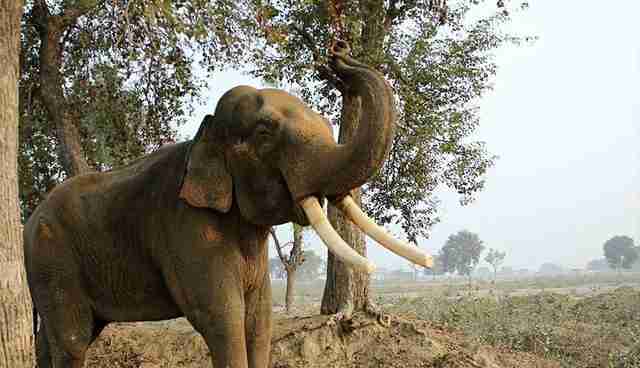 Today, Suraj enjoys mud baths, basking in the sun and taking long strolls in fields - all with a smile on his face. 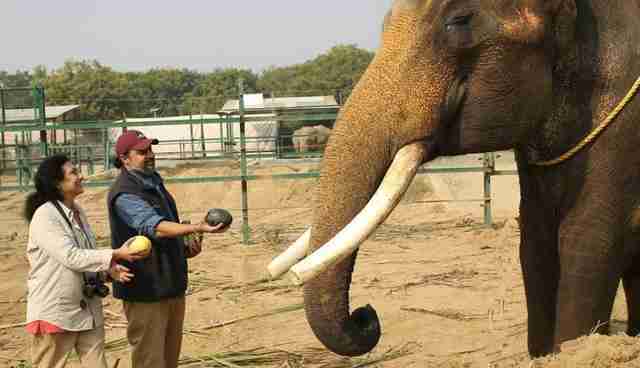 He's known as the "handsome tusker" of Wildlife SOS and now spends his days being spoiled with treats and affection from his caretakers. It would seem as if he's finally left behind the sadder days of his life as temple elephant and fully embraced the freedom he should have had from the very beginning. 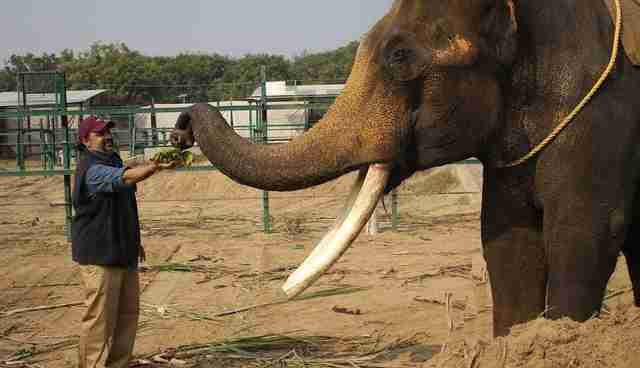 "We hope that his rescue will shed some light on the plight of temple elephants in India," Satyanarayan said. 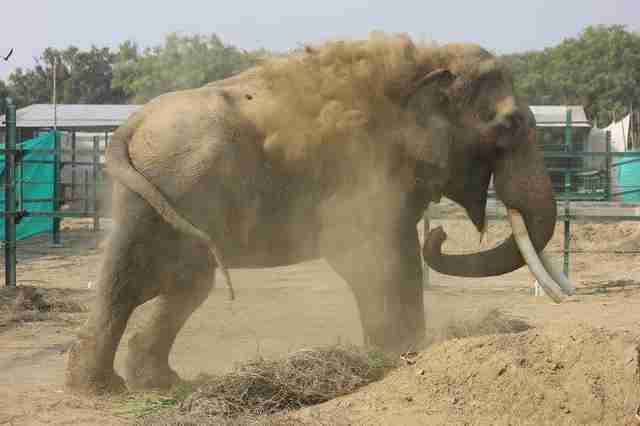 "It is time for us to treat the heritage animal of India with more dignity and respect." 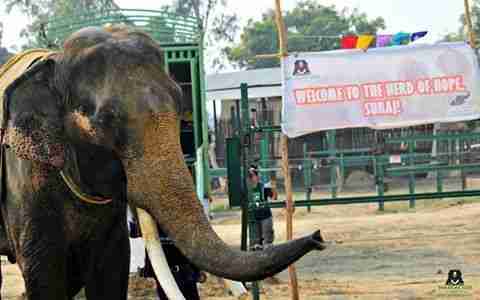 Do you want to help Wildlife SOS save more elephants like Suraj? Consider making a donation here.